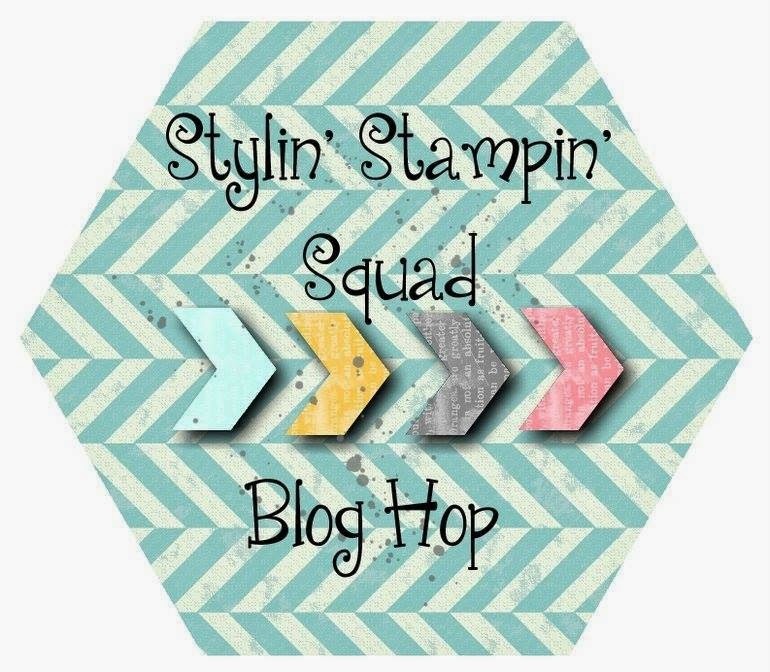 Good morning and welcome to Stylin' Stampin' Squads June Blog Hop! This month we are super excited to be sharing projects and ideas made from products from the all new 2014 Stampin' Up! Annual Catalog. We hope that by the end of the hop, we have inspired you to go create and have fun! Have that pen and paper ready, cause we know that you will want to add some new items to that "wish list"....yes....we know you have one (we all do)!! This will be our last blog hop for Stylin' Stampin' Squad, but don't cry....we will continue a monthly blog hop, but it will be with our design team members over at out main blog, Stylin' Stampin' INKspiration, so be sure to come visit us in July! As you hop along, please be sure to comment and show some love on every blog! We are always excited to hear from our followers! You should have just left stop number #1 on the Stylin' Stampin' Squad Blog Hop - Darcy J. with DJ's Stampin' Place. If so, you are in the right spot. If a link doesn't work or you get off track, you will find the full blog hop lineup below. Just like everyone right now, its hard to really pin point a #1 favorite item from the new catalog. I mean, every time I pick up the darn thing, I find something new and exciting. I've already had to redo my "wish list" at least twice, but that's ok, the good thing about this new catalog, is that there is something for everyone and I have a whole year to get my goodies! One of the first items that I did add to my shopping cart on June 2, was the Flower Patch Bundle. This is a two step stamping set. The bundle comes with a photopolymer stamp set and the matching framelit set for easy cutting out. With all the different layers in this set, the possibilities are endless as to the different flowers you can create. Another thing I also love about this set, is that it comes with three sentiment stamps. For my hop projects, I decided to create a card and decorate a box. This set will be given to my Mom for her Birthday. I plan to put some jewelry in the box. I decided to use the color combo of night of navy for my base, which I embossed with the new large polka dot folder, the banner is using crumb cake and the flowers and leaves are stamped in crisp cantaloupe, pistachio pudding and night of navy. For some fun bling and accents to my card, I tied a triple looped bow using the gold bakers twine, cut a piece of the new venetian crochet trim and a cut piece of gold sequin trim. I colored two basic pearls in the darkest shade of daffodil delight blendabilities and added them to the center of each flower. On the inside, yes, we can't forget the inside. I stamped a matching flower from the outside and added some leaves around it. Making sure to leave room for a nice hand written message. A close up of all the outside goodies! Now the box is one of our many different sized boxes we offer. This one just happens to be the decorative window gift box. It comes in a pack of 6, so you have plenty to decorate and give later as you need them or great to decorate for maybe birthday party favors. The only flower stamp I used, was the night of navy center for the flower. The rest I used only the framelits. I cut several of each out in crisp cantaloupe, crumpled them up in my hands and inked the edges. I did the same for the leaves. I punched holes in the center to hold together with an antique brad. I hope you have enjoyed both my projects, leave some "love" and head over to stop #3,Diana E. of Stampin' Fun with Diana , I just know you are gonna love what she created! Cynthia, your card and box are GORGEOUS! Those flowers truly make a bold statement. Love the 3D of the flower on the box! Can I just say FABULOUS!!!! I love both the card and matching box, every detail is perfect, your mom will love it. Your card and little box are SO CUTE! I love them both! You are rocking that new stamp set! These turned out so pretty! I love the color combo! Love the color combo! I really hadn't noticed this set but may just have to take a serious look at it now after your great card and box. I do particularly love the flower on your box - when you stack the various cuts, do you use dimensionals in between layers or just stack them directly. So nice! Thanks everyone for the nice comments. I really had so much fun with these projects. The flower on the box, Peggy, are just stacked on top of each other then held together with one brad. once the brad is thru and folded in the back, all I do is start with the top one and start folding and bring it to the center and gathering it. This makes it look nice an full and fluffy!! !